Chandler, David G. On The Napoleonic Wars. London: Greenhill, 1999. 272 pages. ISBN 1-85367-349-8. £11.95/$19.95. Paperback. 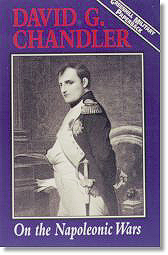 Greenhill Books has published in paperback, David Chandler's On the Napoleonic Wars. This book is a collection of his essays, articles, and other works published over past three decades in many different journals or papers given to various audiences, but never previously published. There are a variety of topics ranging from the British re-conquest of Egypt to the Battle of Sahagun to Robert Wilson's thoughts on the Russian Army to the old debate of column versus line. The essays are well written and can easily be read in one sitting. Many of the pieces are thought provoking, such as his assessment on why Napoleon fell, while others are surveys of a particular battle or action. There is even an essay on how Napoleon viewed the individual marshals! Napoleon's comments may surprise you! For example Napoleon is quoted as saying "Victor... was better than you might think," while "Mortier was the most feeble." Doctor Chandler also examines Napoleon's role at Marengo, how over time he turned this near disaster into a public relations coup, and how the official version of events changed three times. One chapter in particular stands out, not because of its insight into the thinking of the great leaders of the time, but because it contains the journal of a 14 year-old boy who served as a groom to a British officer during the Waterloo Campaign. It is very interesting because it chronicles what it was like to be cooped up with 40 horses in the hold of a ship! Something you won't find in the journals or diaries written by officers! Doctor Chandler does two essays on Wellington in the Peninsula, including a re-assessment of his role there and his use of guerrillas. The reader might enjoy comparing his thoughts on Wellington to those of Jac Weller's, which can be found in Greenhill Books recently released book On Wellington: The Duke and His Art of War. Doctor Chandler closes with a detailed annotated bibliography for each chapter, which allows the reader some insight in what he views as the more valuable works on the subject. Although no topic is covered in depth, they provide the reader with enough information to serve as a starting point for his own research.